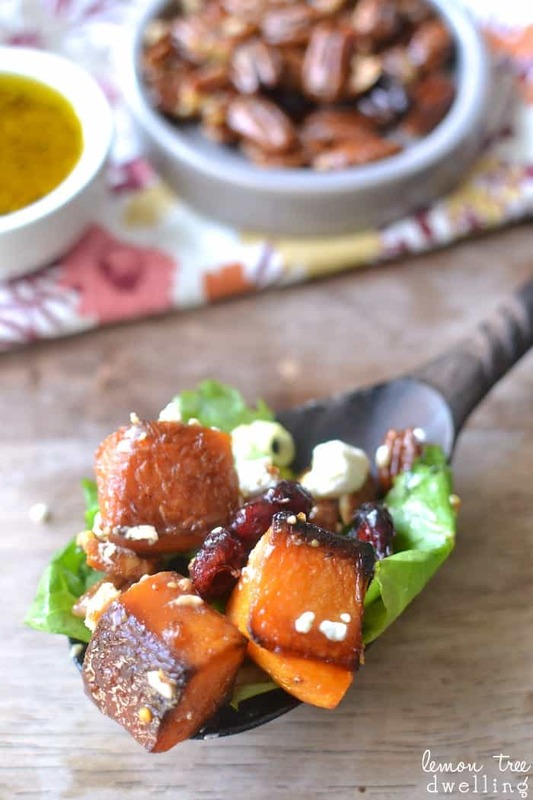 Roasted Butternut Squash Salad is a perfect addition to your Thanksgiving table. 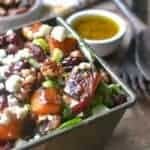 This gorgeous salad is full of tasty fall flavors, comes together quickly and looks beautiful next to your turkey dinner! I know I’ve mentioned this before, but when it comes to bringing food for a holiday meal, I’m most likely bringing salad. Probably because it’s something I love to eat, and I especially love the lightness and freshness of it on days when all the other options are so heavy. So in my mind, the salad is one of the most important parts of the meal! Well…..I’ve come to learn that I’m pretty much the only one who feels that way. 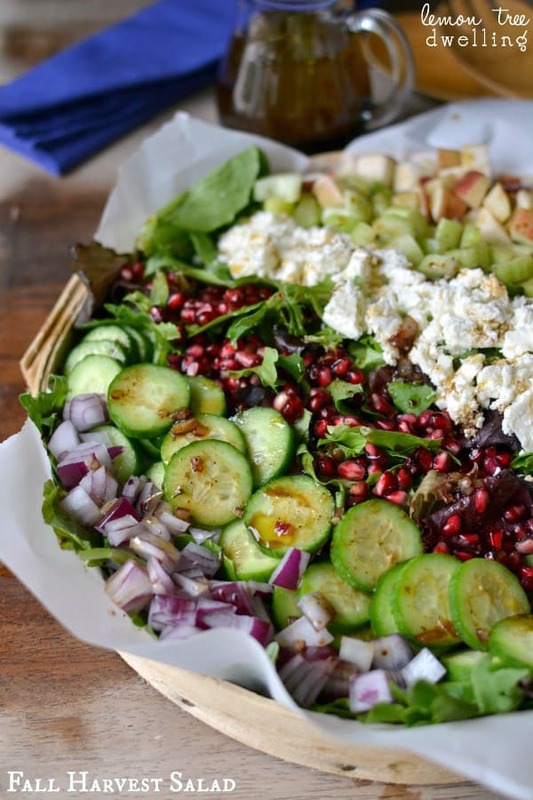 Most people see salad as “filler”….aka the LAST thing you need on an already packed Thanksgiving menu. Sure, people might eat a little bit out of guilt or obligation, or even to make me feel better, like the dish I brought wasn’t a total waste….but no one’s writing home about the salad. And even though I know it’s true, there’s something in me that’s bound and determined to change that. And so I continue bringing salad! It’s almost like I want to share my love of it and help nurture their love of it. Like if I can just bring the right salad……they’ll get it! 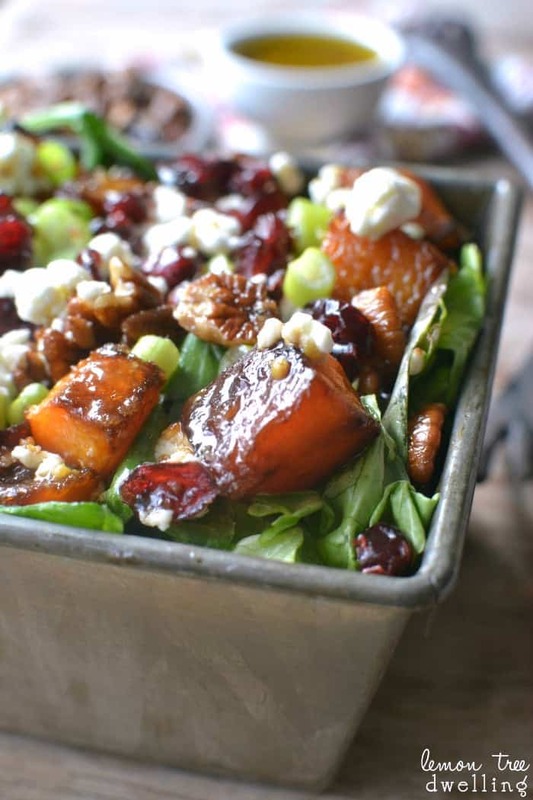 And I am certain my Roasted Butternut Squash Salad will be the winner! I’ve definitely made strides. I’ve learned what people like and when. 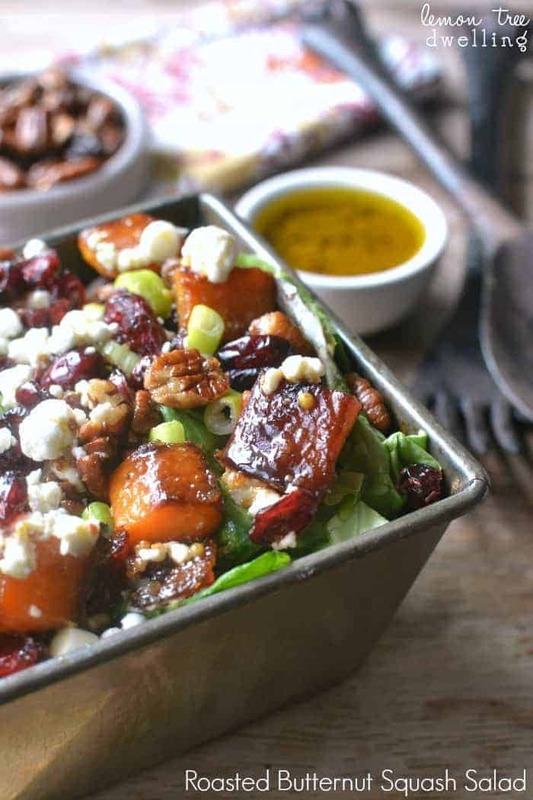 Greek salad at summer gatherings, my Sicilian Spinach Salad with friends, my Raspberry-Brie Salad with my mom, Cherry, Pecan & Goat Cheese Salad at Christmas……and now this Roasted Butternut Squash Salad for Thanksgiving! Notice how I just added it right to the “success” list? I’m convinced. THIS will be a Thanksgiving salad to write home about. And if it’s not? Well, then, I guess I’ll have to take the rest home and enjoy it myself. Let’s just say it’s a price I’m willing to pay. All for the love of salad. Here’s another delicious salad option for you! Follow me on Pinterest for more wonderful recipes! You know I love your salads! I’m with you in thinking it’s an essential part of any meal! This looks like one I would devour so feel free to join us anytime 😉 Looking forward to trying it! Oh, my gosh, this salad looks so good, I wish I had a bowlful right now! Thanks for sharing. This looks amazing Cathy! 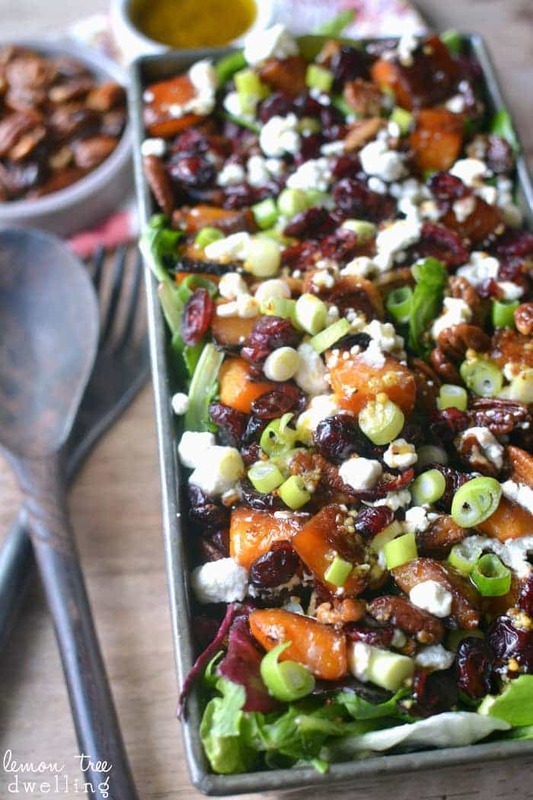 It has all the things I love in it (feta, pecans, squash). Yum! Just tried your salad yesterday and took it to a dinner party potluck. It was a huge hit! And it’s not even Thanksgiving, lol. The host was making barbecued Babyback ribs, and I knew there was a seafood side dish and asparagus. So this salad was the perfect complement to the meal, and everyone raved about it! Thanks so much for sharing this gem with us. Hi Angela, I’m so happy to hear everyone enjoyed it! Thanks for letting me know! This salad is so good. Loved it. And relatively easy to make. Most difficult part was peeling the squash. Thanks for a great recipe I will definitely make again. How many people would you say this serves?? We made this salad as part of our TG meal this year. It was the favorite dish by far!! WE LOVED IT! Making it again for Christmas dinner! Thank you! How do you make the dressing? Just combine the vinaigrette ingredients and shake well! omg this salad… so so good. Definitely saving this recipe! Thank you so much for spreading your love of salad! 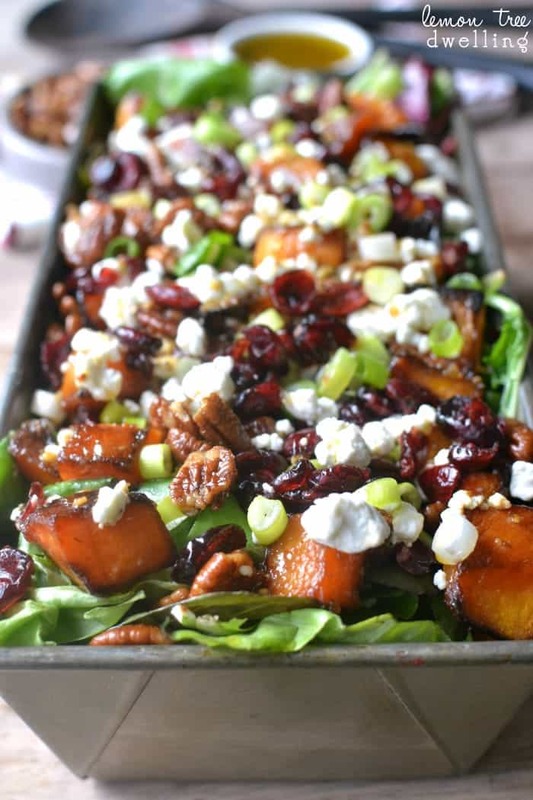 I want to make this, can you roast the squash ahead of time…say roast it today to use tomorrow?? Wondering the same or is it better if the squash is still warm when its served! I made this last year for Thanksgiving… it was REQUESTED this year because it stole the show last year!!! Very tasty! And fairly easy to make. My best friend introduced me to this salad a year ago, and I was hooked immediately, my family loves it, as well. This salad, scaled up for 50 went down a treat at our church lunch in December. Thanks for a super recipe! First off let me say this is an amazing salad that will become my go to on a regular basis. The only problem I experienced having made the salad twice now is if the nuts and squash are cooked together, before the squash is even half cooked the nuts are burnt black. I needed more control over the roasting of the nuts so I tossed the burnt ones and toasted new nuts on the stove top. Too my surprise they were toasted within 3 minutes so it makes sense if they are cooked for 20 minutes in the oven they will be burnt to a crisp. This salad was the best thing on the table at our Friendsgiving! My husband said it was the BEST salad he has had in his LIFE! Wow! And he rarely comments on food! 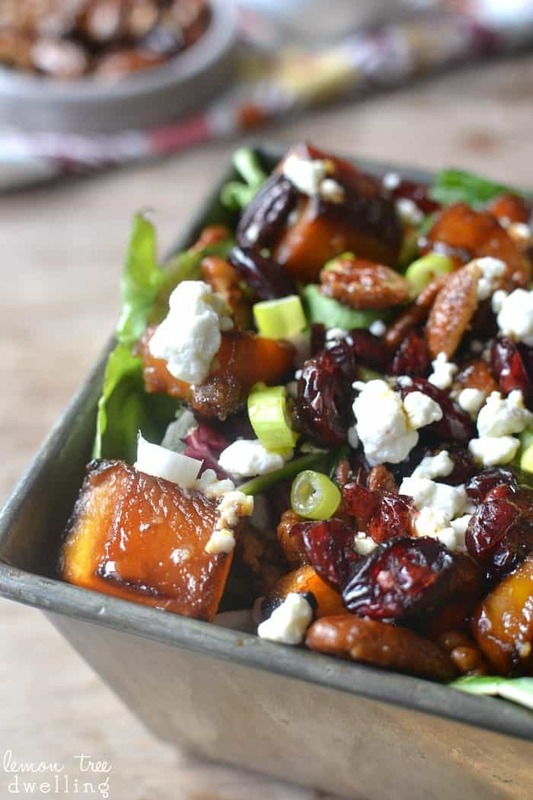 The candied pecans and butternut squash mixture with the goat cheese and green onions…amazing!!!!! Thank you!!! Will be making every year!!! Would tripling be enough for 13 adults? What kind of oil do you use for the dressing?